Today my Dad turns 67 years old. Every year his birthday rolls around and we all ask the same question.... what can we get Dad for a gift? We have yet to come up with a good answer. Sometimes its something homemade from the grand kids, sometimes it's something vintage and cool about the city of Detroit (where he was born, raised and we all live near today). And some years, it's simply a mushy card and we leave it at that. You see, I'd like to think that it isn't because he has lazy, ungrateful kids, but more along the lines that he is the man that already has everything. Sure, he appreciates the tokens and trinkets, but what he really loves most is being with his (amazing) wife, his kids and his especially adorable grand kids. I typically am the one that bakes the birthday cake, because, well, that is just my jam :) So this year, I thought, okay, I'm really going to put thought, attention and of course, love, into this cake choice. When my Dad was growing up, his parents owned a drug store in Detroit. My Dad would tell us storied about the soda fountain counter that was in the store. he has such fond memories of that store and that counter. So much so that he actually has a slab of the marble counter in my parents house as the hearth in front of their fire place in the dining room. So thinking of childhood memories led me to think of that soda fountain. My parents keep this original piece of equipment in their kitchen. Thinking about that soda fountain machine and the counter and milkshakes made me think of the malt flavor that I love and I know my Dad loves too. I went looking for recipes. I found what looked like a delicious and simple cake recipe for a malt flavor cake and I even went to three different grocery stores until I found the malt milk powder. I was on a mission to get this just right. The cake batter looked creamy and smooth. The frosting was rich perfection. The smell of the cake baking was so warm and sweet and filled the house. All I could think about was I hope this cake comes out tasting as delicious and loving as my intentions were. All I wanted to do was give my Dad the gift of showing him how much I love him. What better way to do that than by baking for him. It is just my way. The cake cooled, and I frosted it. 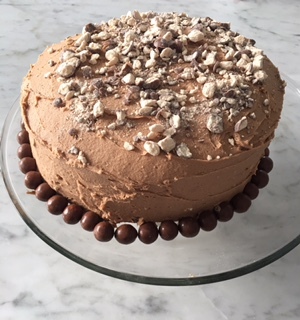 My daughter helped to arrange the chocolate malt balls on the cake in the perfect design. It was ready. I set the cake down on the table with the candles burning, everyone ready to sing and I saw my Dad smile. That is what I was going for. Once the cake was sliced and served, my Dad took a bite. The first thing he said was how he could taste the milkshake from that fountain shop. He was happy. My heart was full. Happy birthday, Dad. I love you so much. I hope the taste of that cake made your heart and mind fill with 67 years worth of good memories. Thank you for being you, for giving us all all the wonderful memories and details of our lives that are so rich and delicious and we taste them and enjoy them each and every day. I planned what I hoped would be a fun event for this group of a dozen high school students. We were using a space that didn't include a full kitchen (us many of my groups do) so we were limited to some appetizers and desserts. The teens had a great time working together in small groups to complete a recipe for the larger group. Many were tasting foods they had never tried before. Many were stepping outside of their comfort zone "cooking" because this was new to them. They did great! They communicated, they problem solved to complete their dishes and the best part was they were having a good time doing it all. The highlight of the program, for me, was when I asked the group about some of the challenges they faced when completing their dishes in a small group. One of the girls was telling me how she was working with a friend who just jumped right in; no plan- just DID. This was not her style. She is more of a perfectionist and her friend's method made her stress about the activity. Then she said, she realized, she didn't want to yell at her so instead she had to tell herself it was okay, that this would work out and she would adjust. I was blown away! I asked the young lady if she knew what "self awareness" was, she said, no. I went on to explain to her that in that moment what she did was take a moment to check in and her own feelings, think about them, and choose how to handle herself. She was mindful of how she was feeling and she made a conscious choice about what to do next. I was so impressed and proud. I tried explaining to the group how this is what cooking can provide; the opportunity to be mindful, aware and learn how to make good choices for yourself and those around you. A Culinary Art Therapy session that was truly a success! And of course, always delicious! Today was a cold, overcast dreary kind of day. So I was happy to be inside and tinkering away in my happy place, aka my kitchen. A few weeks ago I saw one of my favorite Food Network chefs (Ina Garden) post something about Butternut Squash Bruschetta. I saved the link but never actually gone around to reading the recipe. So today I was going to take my hand at it. I keep a stash of frozen French bread slices in the freezer. They are a great item to store. They are a great base for appetizers, dipping in soup, croutons, etc. Also perfect for bruschetta. I preheated the oven to 425 degrees. Mix a few tablespoons of olive oil, a pinch of sea salt, garlic powder and dried parsley for some color. Using a pastry brush, coat both sides of the bread with the oil mixture. Place on some parchment paper and bake on each side for about 7 minutes until golden brown and toasted. Then turn the oven off. Set the bread slices aside. I gathered all my other ingredients for the dish. I chopped into very small pieces 2 shallots. I sautéed them in olive oil, salt and pepper. Then I mixed them into about 2 full tablespoons of ricotta cheese. Seth that aside. In the same pan (no need to wash in between) I added small bite sized chopped pieces of butternut squash. Sauté in olive oil on medium high heat until fork tender and browned. Sprinkle some salt and pepper over the squash then set aside- off the heat. Now we're ready to assemble. I spread a think layer of the ricotta onto the sliced bread. Then I added some squash on top. Using a fork, I drizzled some honey over the bruschetta. It was delicious. It felt sweet and savory at the same time, a bit of fancy comfort food. After I made my bruschetta, I went back and read Ina's version. Her's was pretty similar. She combined the shallots/ onions with the squash and she used maple syrup instead of honey. It made me feel good that I could come up with something comparable to THE Ina Garten. This recipe reminded me how much fun it can be to skip the recipe and just trust yourself in the kitchen. There is something to be said about letting the creativity flow and remember there is no such thing as a mistake when you're cooking. If it tastes good to you, then it works. I think this is a kitchen lesson to remember in life. Sometimes, if it works, than it's a success. As simple as that. Yesterday I got home from work around 4:00 in the afternoon. My kids had spent the day at the pool with my Mom and Aunt and they came home STARVING.I walked in the door, got my kisses, immediately followed by "What's for dinner?" I had no clue. I didn't even take my shoes off yet. But I knew I had to think fast and come up with something good. I am a believer in better to eat an early dinner (hello early bird special) than to eat junk and eat just more. I had just been to Trader Joe (the best) a few days earlier and I had been meaning to try out a taco night with my kids. I had some ground beef waiting to be cooked in the fridge, and I knew I had all the toppings, so this was the night the tacos were coming out. It was a huge success in my book. Here is how I made it happen. I quickly grabbed my pound of ground beef (feel free to substitute ground turkey or veggie crumble) and I browed it up in a pan with some garlic powder, salt, pepper, taco seasoning and a tablespoon of tomato paste. Then set that aside. I chopped up fresh romaine, tomato, corn (I didn't have fresh, so I used can, almost as good) and some sliced back olives. I had some rice already made from the night before. Feel free to also include guacamole, sour cream, salsa, beans, or some shredded cheese. I lined everything up in brightly colored bowls and called the kids over to come and build their own taco. They were delighted that everything looked so fun and they got to build their own taco. Here is how it all looked. Every night and each family should define their successes differently. My son made his taco and was willing to taste and take a few bites, that is MAJOR for him. My daughter is my adventurous one, she picked almost every topping and enjoyed two tacos. for the grown ups, we made taco salads. Pile it all high on a plate and toss in some hot sauce. It was delicious and fun, and we all enjoyed being together. To me, that is 100% a successful family meal! Give it a try and see what toppings can bring your family around the table together. I have the most amazing parents. Period. There really isn't much more to add to that. They are the most supportive, loving, kind people and I am lucky enough to be able to call them MY parents. Not only are they both just exceptional human beings, they are also a model couple. Not perfect, they have their quirks (don't we all), but they accept each other totally and lovingly. Quirks and all. They also happen to be married for 45 years! Their anniversary was this past weekend and after years and years of gift giving and brainstorming and celebrating, I was just at a loss for what to do for them. So when all else fails, I cook! We had a wonderful Sunday brunch with the whole family and close friends that came to celebrate this special milestone. We had a yummy greek yogurt trifle; layers of berries, mango, greek yogurt, crunchy granola, and local Michigan honey drizzled on top. I had some frozen pie crust that I used to make a quiche with crimini mushrooms, chives and chevre cheese. Baked to perfection. But my personal favorite is a recipe from one of my favorite cookbooks. Huckleberry. My very first blog post was about a blueberry cake from this book. Also amazing!! This time, the recipe I made (I've made many time before) is for the carrot apple teacake. I put my own spin on it. I made the recipe in muffin tins, instead of a loaf. I leave out the nuts and nutmeg. I also leave out half the sugar- they don't need it. These are just so delicious. They even look tasty raw! Next time you are looking for a recipe to bake up some love for your friends or family, this is for you. They are delicious! Apparently, today is national caviar day. I know this is a delicacy to many people. I'd like to think I have a pretty sophisticated palate, but, I am just not a fan of caviar. It does not appeal to me. So this got me thinking, how important is it to be refined? Time and place, that is for sure! I am a big fan of going out to eat, trying new restaurants, new dishes and new flavors. My husband and I really enjoy going to upscale restaurants and expanding our culinary horizons. At home, well, things are a bit different. I believe it is important to offer new foods, and flavors to my family. Give them the opportunity for new things and let them see us being adventurous and taking culinary risks. As for them, if they choose to, fantastic! If they don't, they are still pretty little, they have many meals ahead of them to decide to try new things. Sometimes, we just need to be realistic and keep the menu on the level of good old chicken nuggets. Dinner the other night was just that. I was in the mood for this dish that I make with ground beef or lamb that is combined with pine nuts, tomato, fresh parsley and cinnamon. The meat mixtures is filled into triangles of phyllo dough. I was out of the phyllo dough. I was going to stuff some onions or peppers, but I didn't have enough of those either. So I made the same recipe and I made them into meatballs. I cooked them in the oven while I made some jasmine rice and a vegetable salad to serve them with. My craving was fulfilled. My kids, I suspected, weren't going to go for it. So I threw some chicken nuggets (Kosher, all white meat, from Israel) in the oven, along with some natural baked frozen french fries. Something for everyone. We sat all together. The table was full of options and everyone enjoyed each other's company. All in all, a very real and still successful family dinner. In my family, we love birthdays. I mean L O V E birthdays. The celebrations last for days, sometimes weeks. There are multipe cakes with candles, singing, presents, phone calls, and of course meals to celebrate. My Mom is the one responsible for this intense love of birthdays. And to be honest, it is one of the many reasons why I love her so much. She doesn't care if she turned 30, 40 or in this case 64. Every year brings 365 reasons to celebrate. She believes this with her whole heart and I think this is a wonderful way to live. I think she inherited this deep belief from her Father, my Papa. Papa was a Holocaust survivor and he reminded us regularly that his survival was a gift. He would say "tomorrow is never promised." he lived life to the fullest, always had an ear to ear smile on his face. He loved everything about his life, mostly his wife, kids and grandkids. And of course, he loved to eat. He was Hungarian and Hungarians are no stranger to good food, especially pastries. Most cities my Papa visited, he started with that cities bakeries. It brought him such joy. A favorite dish of his, and one that he and my grandma would spend hours and hours making for their family is called "derelye." This dish is a sweet ravioli filled with a prune jam called "lekvar." My Grandma remembers making this recipe from 10 cups of flour. It was a day long event. And they would save this dish for special occasions, like birthdays. Even as an adult, this was the dish that my Mom would request. So this year, on her 64th birthday when I was trying to think of what to get my mom for her birthday, this dish came to mind. First, I thought I would surprise her. I would make the recipe and have her walk in my house for her birthday dinner and she would see these raviolis and I could imagine the sounds of delight she would make. But then I rethought my plan and decided I wanted her to be part of the baking with me. No way to better spend a few hours together then baking side by side in the kitchen. I shared my plan with her and she was thrilled! Got to love the internet, I googled the dish and I found one site in English that sounded like a similar recipe to how my Grandma use to make them. I followed this recipe to make the dough and it turned out great. We only made enough for one meal for 6 people so we weren't at it all day. I would say 2 hours from start to finish and we had our final, delicious product. First we made the dough, a basic pasta dough, really. Then we made the buttered breadcrumb topping. The most fun part is of course the filling of the raviolis, my favorite teamwork part. I rolled the dough, cut the squares and my mom filled them and pinched them. Then I placed them in small batches into a large pot of boiling water for about 10 minutes. When they come out of the boiling water, you cover them in the buttered breadcrumbs and serve. Or in my Mom's case, start eating before they make it to the serving dish. The second that butter was heated and combined with the breadcrumbs, the house filled with the smell of childhood memories. Her childhood and mine. She could picture her parents standing and working together in the kitchen and she saw her siblings as little kids. I saw all of us sitting together around my grandparents dinning room table and celebrating a birthday or a holiday together. That smell and the taste took us both back. The best part, though, was sharing in this stroll down memory lane together. Such special memories were conjured up in both of our minds. My birthday present was a success and it tasted delicious! I'm so glad I thought to share this experience with my mom. I know we created more memories by doing this together. And I know we'll make them again. I spend a lot of time thinking about feeding my family. What are meals that they all will eat-- and enjoy. When can I squeeze in a trip to the grocery store? What items do I already have in my pantry/ fridge that I can use to pull a meal together with? What is something new? Have I made their favorites lately? So much to consider! Lately, I have been thinking about one thing in particular. How can I cook for my family, while I'm doing my other jobs/ staying sane/ and find time to ENJOY my meal prepping. Is it possible to do it all? 1. Keep it SIMPLE. No eight course tasting menus for this Mom. I've said it before, and I'll keep saying it. Simple + Easy = Success. Here is what I mean by simple. I'm driving home yesterday after work. My wonderful/ amazing/ superman of a husband had already picked the kids up from school. My plan for dinner that night was to make some macaroni and cheese. I was thinking about dinner the next night. Shabbat dinner when my whole family comes over. I had clients scheduled the next morning, mom duties, shopping to do and maaaaybeee even a little time for myself. So I wanted to make dinner for tonight, last night. It was a cold and rainy, miserable day, so I was thinking comfort food. Meatballs, mashed potatoes and roasted veggies. Well, I got home and sushi and pizza had already been purchased. (no judging :) So I was free to get cooking for the next night. The kids were fed and happy. I had requested 30 minutes of quiet so I could get this meal going. To my surprise, my kids listened. They were playing in the basement and actually left me to cook. I quickly rethought the meatballs. No time to make sauce, then roll the meat. I regrouped and the meatballs turned into meatloaf. Faster, less labor involved. Check. I moved on to my mashed potatoes and onions. 2. Be Flexible. So what the meatballs didn't happen. I'll get to them another night. Instead of beating myself up for not being able to make my original plan, I was just happy that something was made. 3. Know when to call it quits. I had almost thirty full, glorious minutes of quiet. I was mixing and chopping to my hearts content when the kids called up (okay, honestly, for the 3rd time) that they had prepared a show and wanted to perform for us. I checked the boiling potatoes one last time and left them to simmer away while I watched the show. I knew I could finish the mashing and mixing later. I was 90% of the way there. I'll call that a win. The show the kids prepared lasted all of two minutes. They were thrilled we came and watched, we applauded like it was Broadway and then they allowed me to return t the kitchen. The potatoes were done by now and I drained them, mashed them, added the sautéed onions and non dairy cream. I left them to cool so I could refrigerate them until the next day. My meal was made. All I have to do tonight is bake and serve! It feels great knowing that it's all ready and waiting for me. My hope is that everyone will eat and enjoy. No one will miss the meatballs and no one will care that last night's dinner was sushi and pizza. I'm taking this one as a win! I know I say it often, but simply cooking really is the way to go. Many times people will tell ask me how I do it all. I have a full time job, my new practice, a husband and two little kids, friends, parents, a sister, and the list goes one. I do it all because we all do it... it's my life. Everything on this list is something I love and is important to me. I am also a big believer in only doing things that matter to me. True, this can't always work out the way I'd like, but I try my best. I also try to do things in the most efficient way; sometimes this means doing something quickly and just getting done with it. Sometimes it means being more strategic. Tonight I am cooking my usual shabbat/ Friday night dinner. I am also trying to get 10 other things done in the short hours while my kids are at school. So my menu was planned last night and my grocery shopping was done early this morning. My wonderful husband will light the grill and the staring role in tonight's meal will go to BBQ chicken and flank steak. Supporting, and yet equally delicious roles will be played by fresh heirloom tomato salad, roasted fingerling potatoes, baby zucchini and... corn on the cob. Here is where my strategic dinner planning comes in. My long time mentor and friend, Ellen, who has taught me everything I know about how to be a good social worker has influenced my most recent thinking in the kitchen as well. We have been talking a lot about this fantastic book. The Body Keeps The Score by Bassel Van Der Kolk. I won't get into too many of the details since this is suppose to be about my corn :) but I will tell you this. Van Der Kolk talks about healing trauma. We all have trauma in our lives in one way or another in varying degrees. Hopefully, we work through this. Van Der Kolk believes that a productive way to work through this trauma is by using the idea of repetition, cadence, is the term he uses. Flow, rhythm, patterns.... this is my dinner tonight. Getting back to my corn... I found fresh, beautiful corn in the market this morning. I came home and shucked, washed and got my corn ready. I prepared individual pieces of tin foil. I poured about a teaspoon of olive oil in each piece of foil, a sprinkled my favorite french picnic salt on each piece of foil and then i rolled a piece of corn in each piece of foil. I repeated this 8 times for 8 pieces of corn. Assembly line cooking at its best. For a few minutes, I wasn't thinking about anything other than my pretty corn. It felt great to get lost in something easy, simple, and soon to be delicious. To me, this simple task/ dish personified CAT. Routine, pattern, predictability, and a fantastic outcome that was going to please my family. Nothing better than that if you ask me. Thank you Ellen for teaching me so much. You even brought my corn a whole new meaning. ....Well actually my Bubbie didn't do much cooking on Passover, or any other holiday for that matter. Let's just say she was not my culinary role model! (She had other fine qualities, they just didn't shine in the kitchen.) I have always done things my own way. I believe in doing things they way they feel right for me, not just because that is how things should be. That is how I cook too. So while others might be cooking matzo ball soup or kugels for Passover, I'm looking for a bit more in my dishes. Quinoa is a favorite of mine. On Passover it's even more fantastic. Kosher for anyone who keeps the holiday and packed with lots of nutrients and flavor when done well. I found this recipe while cruising Pinterest. I made some of my own modifications, I skipped the baby corn and pineapple in the salad and for the dressing I simplified by only using the oil, vinegar, honey and soy. The peanuts are for those that eat legumes on the holiday, which we do, thankfully. The full recipe is from a blog I found called My Food Story. I would definitely reccomend trying this one at home! Sunday night dinner. They are usually a pretty good dinner. Mainly because I'm not running to get home from work and pick the kids up from school. It's a slower pace day, I even had time to grocery shop. Combine all of that with actually having all the ingredients for ONE meal that everyone eats. Such a treat. This week I had a conversation with a client about how sometimes complicated food isn't always the best. More ingredients don't always produce a better, more tasty dish. Sometimes there is something to be said about simple. 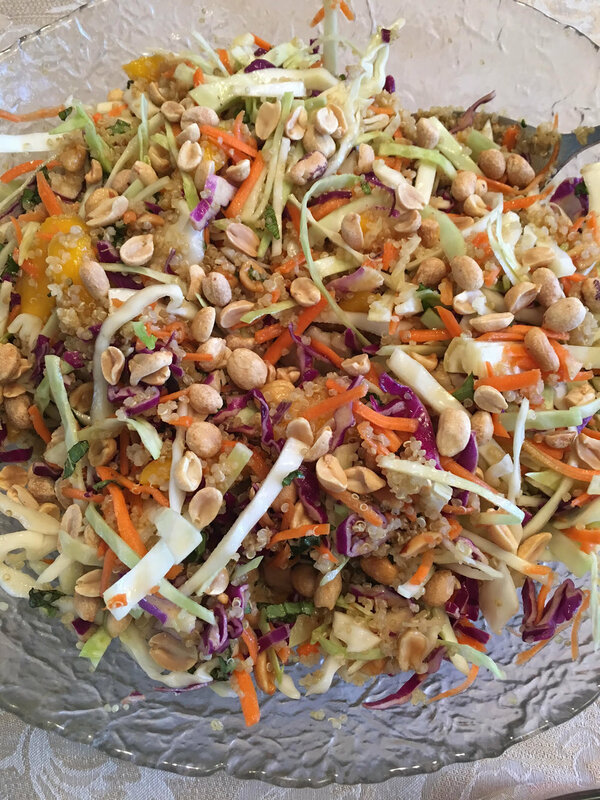 Fresh, healthy food that can shine on its own. So that is what I was going for tonight. I looked in the fridge and pulled out lots of fresh vegetables. Tonight it was corn on the cob, asparagus, butternut squash and sweet potatoes. All cleaned, peeled, chopped and then roasted. I only added 2 simple things: olive oil and a salt combination that I just love. It so good on so many different things. One pan (easy clean up always a plus), and I roasted on 425 degrees for 20 minutes until golden brown. The real star of this meal was the salmon. Before I cooked it, I cut into single portions (less cooking time = feed hungry family faster) and played on a baking pan. I then spooned a teaspoon of dijon mustard onto each piece of fish. I sprinkled some dry dill, kosher salt and pepper and placed some small lemon slices on top. Roast for 10-12 minutes on 425 degrees. This was a fast, healthy dinner that everyone (even the non fish loving husband) ate. Best part, there were leftovers to take for lunch tomorrow. This meal felt good to eat and cook, a pretty good way to get this week started. This past Sunday was a holiday called Purim. Like so many other holidays, one of the traditions we have is all about food. (Shocking, I know!) The traditional Purim cookie is called a Humintashin. These 3 cornered cookies are usually filled with some kind of jam or jelly, chocolate chips, etc. My favorite is an almond pie filling but I'm the only one in my house that likes those so we make more of the apricot jam filled, poppyseed and of course chocolate chips. These cookies are the most amazing thing. The taste is sweet, but not too sweet. There is a little orange juice in the dough that provides just a hint of tartness. But more than the taste, these are cookies with a story. The recipe that we use in my house is from when I was in preschool- yes, that long ago. it is a tried and true favorite. I also love telling my kids each year the history of the recipe. It's a whole family affair making this recipe. Usually it involves my mom, my sister and of course my kids. My daughter especially is into baking and helping in the kitchen. So I lay out the parchment paper and create work stations for everyone. The flour comes out, the fillings, the rolling pins, etc. Each helper has a job. We operate like an assembly line. A true team effort. This year was really special. My 6 year old, for the first year of helping, actually made her own humintashin from start to finish. She rolled her own dough. She cut the circles out herself. She filled the jam and she made the most perfect pinched corners. I was so proud. They came out so beautiful! It makes me so happy to know we do this together. Our Purim tradition. The success is so very sweet! I was so looking forward to cooking Friday night (Shabbat) dinner for my family and some friends that I was introducing for the first time. Some cooks I know, would get a little flustered because one guest I was cooking for is gluten free and another guest is a vegetarian. I did have to give a bit more extra time for meal planning, but I made it work no problem. I am a believer in cooking one meal for everyone. If everyone can't eat it, then it isn't going to work for me. I have to say this meal might have been a personal best. I picked some great recipes from Bowl + Spoon and I got to work. The one slight variation I made was for the vegetarian dish (that I created). I tried to make it as simple as I could. So I made stuffed vegetables two different ways. For the meat eaters I sautéed onions, garlic, a fresh tomato and a pound of ground beef. I added salt, pepper, cinnamon, and pine nuts. Once I turned off the heat I added in some chopped flat leaf parsley. I think both versions came out great. And I have to say, I am not a vegetarian, but I definitely enjoyed the tofu version. This year for Thanksgiving, I did NOT cook. At all. It was very strange and I missed having the house filled with delicious inviting smells. It was great to be a guest somewhere else and eat someone else's very delicious food, but I missed that feeling in my own kitchen. So the day after Thanksgiving I made dinner and I made one of my favorite, easy, fall dishes. Roasted Vegetable Soup. I cut up lots of different vegetables; leeks, butternut squash, sweet potatoes, carrots and parsnips. Toss them in olive oil, kosher salt, freshly ground pepper and dried parsley. Then I throw them in a 425 degree oven for about 45 minutes until they are browned and looks amazing. Once they come out of the oven, I add all the vegetables to a large pot. I add in about 10 cups of vegetable stock, or you can use water. I bring it all to a boil, then turn off the heat. 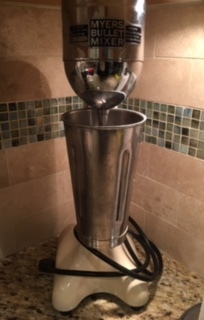 I grab one of my favorite kitchen tools, the imersion blender and mix it all together. Here is how it looks before it is blended and after. It is such a warm filling soup. Feels so right for fall. It is always a hit! This past weekend was unusually warm weather. For the holiday that we just celebrated, it is customary to eat outside in a sukkah. I had been planning to make this delicious, hearty, one pot kind of dinner/ soup, but it was way too hot for soup. My talented and wonderful husband still had a taste for something a bit heavier and satisfying so he decided to make a lamb stew. It was sweet and delicious, but just not what I was in the mood for. I decided that I wanted to serve something lighter. I was thinking salmon. I am really a big fan of the one pt dishes. They are simple, taste good and usually a crowd pleaser. So I was going with Salmon Salad. This is a variation of a recipe from one of my favorites, Ina Garten. The Barefoot Contessa Cookbook has many recipes that I really love, use often and tweak with my own flavors. This time, I added cucumbers, yellow peppers and left out the red onion. I went with Ina's stone ground Dijon mustard dressing and it was a hit. As pretty to look at as it was tasty to eat. Holy moly does this look amazing!! This cake and occasion personifies CAT (Culinary Art Therapy). Cake, family, cooking all come together! You must give this one a try.